These amazing foldable kitchen carts open to give you nine square feet of workspace, then fold to only 5” to 5 ½” for easy storage next to your refrigerator, kitchen counter, behind your doors or inside your closet. 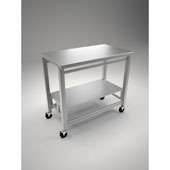 Made of solid wood, or solid wood with a stainless steel frame, these carts use a patented 28-hinge folding design to open and fold within seconds. Their 36-inch height matches the height of most kitchen counter tops. 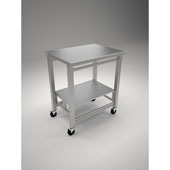 Each has locking chrome casters for easy movement as well as a stable workspace. They are available in four different styles.